Two live releases from the Now What! tour has been announced by earMUSIC. One band, two crowds, two countries – a tale of two cities indeed. From Germany’s Wacken Open Air Festival, one of the biggest metal festivals in the world – and a city unto itself – to Japan and the stately Nippon Budokan, the most revered venue in Tokyo. Each with its own distinct personality. Wacken is a success story beyond par, starting out humbly by two friends in a field in rural Germany and becoming one of the best organized and attended metal festivals ever. We were most impressed by the facilities, security, backstage, camping… in fact the whole production was superb. Festival crowds are unique because most people are there for the occasion itself rather than for any particular band. For us that is always a welcome challenge and a chance to connect with many who may never have seen us before. But the real stars are all in the audience. Thank you, Wacken. By way of contrast, the Budokan is a temple of peace (except for the infamous occasion when all the seating was destroyed). “Made In Japan” was partially recorded there and we’ve played there many times since. For such a large space, the acoustics are excellent; this special building never ceases to impress. But there is, young and old, sitting patiently or chatting quietly – the embodiment of civility. It’s almost like the respectful hush one might find in a cathedral. But they’re here to rock. And rock they do. They may be quiet while they’re waiting but far from shy during the show. They gave us an unforgettable evening. Thank you, Tokyo. “From The Setting Sun… (In Wacken)” was filmed by 9 HD cameras at Wacken Open Air Festival 2013. The show will be available in 3D on Blu-ray. Apart from the 3D Blu-ray, this show will be released as 2CD+DVD and 3LP gatefold. 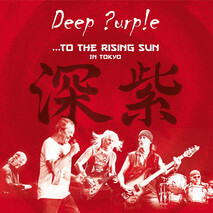 “…To The Rising Sun (In Tokyo)” has been filmed by 12 HD cameras at Nippon Budokan, Tokyo in April 2014. This show will be released on regular Blu-ray, 2CD+DVD and 3LP gatefold. Both shows are released on August 28th, 2015. The audio of both shows was mixed in Hamburg, Germany by Eike Freese and Alex Dietz (Heaven Shall Burn) with the supervision of Roger Glover. Thanks to Lutz Reinert and earMUSIC for the info. Posted by Svante Axbacke on Wednesday, June 24th, 2015, filed under News. You can follow comment on this post through the RSS 2.0 feed. You can skip to the end and leave a comment. Pinging is currently not allowed. How were the performances Gillan wise ,anyone know?! Looking forward to this release. I was at the Nippon Budokan show last April and it was fantastic. Really eager now to see how it was captured live on DVD. I hope from the Wacken show all songs are included. a version I have seen misses the opener “Highway Star” plus a couple of others from the “Now What” album! These concerts would want to contain the entire show. If so, they will be sensational! This should be fun and cannot wait to get me those and crank it up. There is nothing better than Deep Purple live! I’ve got 2 shows coming up in July here in New Jersey and I can’t wait. With a new album do out next year, we the fans are truly very fortunate. I hope this continues for as long as possible. Keep recording those gigs! Very Cool!! We’ll keep an eye out for this one. Glad to see this one is being supervised by Roger. Would be better If he was mixing it but at least he’s involved. That is indeed excellent news. Already have both of them, but that has never been an issue when they are released officially. Still a great band after all these years. Will be buying these as soon as they’re officially released. It’s also nice to hear from Roger too. This will keep me happy until the next studio release. I’m sure the guys have at least one more album in them. Here’s hoping that these releases include all the Now What tunes performed on the nights. There are ample versions of Space Truckin’,Strange Kind Of Woman,Hush,etc already available. at least!!!!!!! Deep Purple live without the orchestra. Of course I´ll wait for them anxiously. Last shows in Argentina, in 2011 and 2014 were very good. Andy, how’s your voice?! Tracy, enjoy the show. Been a while, they were fantastic last August I’m sure it won’t be a bust. As people can see some of Wacken has yet to be seen, and also the Budokan show should very well please with all the cam coverage bringing out the light stick drum solo. That show is actually better than Wacken, as the audio boot easily proves. Thanks Cameron for the setlist. Great nice pair, complementing each other, can’t wait to buy them both. Lately they come very seldom to Spain, a pity indeed. If they really release the 20th album I’m gonna see them wherever, as many times as posible. Does anyone know yet what format the DVD’s (NTSC or PAL) for the two new live albums, Wacken and Tokyo? The both sound like they will be great. Playback Region B/2 :This will not play on most Blu-ray players sold in North America, Central America, South America, Japan, North Korea, South Korea, Taiwan, Hong Kong and Southeast Asia. No such warning for the Wacken show. Oh….another live album. No, make that 2. Milk more dollars out of the faithful.